350 guests joined in supporting the LGBT Network on Wednesday, May 3rd, 2017 to Shake-It-Up for Safe Schools at the "Copacabana Gala” presented by Bethpage Federal Credit Union. The Gala transformed the Crest Hollow Country Club into a Copacabana experience, with VIP cabanas, palm trees, and a soundtrack that kept everyone on the dance floor. The 2017 Gala honored Robert Zimmerman of Zimmerman/Edelson Inc. for being a strong national advocate for equal rights and the LGBT community. Hillary Clinton sent a special video message for Robert. 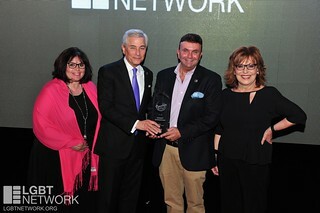 Emmy Award-winning co-host of ABC’s The View, Joy Behar,presented him with the award. The event raised over $200,000 to support the LGBT Network's Gay-Straight Alliance (GSA) club school outreach, which delivers programs in more than 110 schools in Long Island and Queens. Special thanks to this year's event committee for their hard work to bring the Copacabana to life: Linda Armyn, Committee Chair, Bethpage Federal Credit Union; Sammy Chu, Edgewise Energy; Resi Cooper; Frances B. Reid; Gary D. Bixhorn; Paul Fleishman, Newsday; Dave Widmer, Altice; Laurie Scheinman, wit & whim; David Mejias, Mejias Milgrim & Alvarado, PC; Samantha Chillemi, Zimmerman/Edelson Inc. Hear the important words from Hillary Clinton in this video: Hillary Clinton: "The LGBT Network is a powerful force for good in Long Island and Queens"